The ALS-2 Ambient Light Sensor Calibrator provides a quick and simple method of verifying the performance of the ALS-2 in the field. The requirement to regularly check the performance of ambient light sensors (also referred to as background luminance meters) used in aviation systems can be costly and time consuming if the sensor must be removed and sent away for testing. The often used alternative of observing a change in output when the window is blocked cannot be considered to provide a reliable indication of performance in an aviation system. The ALS-2 calibrator has been designed to reduce operational downtime to the absolute minimum whilst ensuring that the ALS-2 under test is both operational and correctly calibrated. It is simple to use by non-specialist staff and comes supplied in a rugged carry case with battery charger and instruction manual. Designed to provide a reliable and accurate check, and if necessary, recalibration of ALS-2 Ambient Light Sensors, the ALS-2 Calibrator is quick and simple to use even by non-technical operators. The battery powered calibrator slips over the hood of the ALS-2 and is secured in place using an elastic strap. 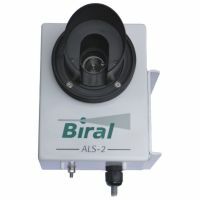 The calibrator then communicates with the ALS-2 using an IR optical link removing the need to disconnect cables or send commands via the system software. The calibration of the ALS-2 zero point and gain is checked against a series of light levels and automatically adjusted as necessary. The operator is kept informed of progress through two status indicators on the calibrator body. A typical test and calibration sequence is completed in less than 5 minutes. 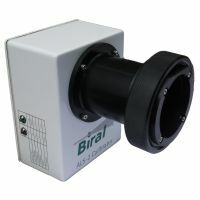 As there is no need to disconnect the ambient light sensor to perform the calibration check system reliability and down time are greatly reduced. The ALS-2 Calibrator is supplied in a rugged carry case and its internal batteries can typically complete 30 calibration cycles on a single charge.